M42 Leicestershire - Two lanes closed on M42 southbound from J11, A42 (Burton-Upon-Trent) to J10, A5 (Tamworth), because of an accident. M1 Northamptonshire northbound severe disruption, from J18 for A5 to J19 for A14. M1 Northamptonshire - One lane closed on M1 northbound from J18, A5 (Rugby) to J19, A14 (Catthorpe Interchange), because of a broken down vehicle. A14 Northamptonshire westbound severe disruption, from J1 A5199 to M1 J19. A14 Northamptonshire - One lane closed and slow traffic on A14 westbound from J1, A5199 (Welford) to Catthorpe Interchange, because of an overturned vehicle. Thanks for joining us for today's updates. We'll be back at 08:00 tomorrow. Dry this evening but cloud will tend to increase then overnight, spells of rain will move their way slowly south and east. Winds remaining light. An 18-year-old man has been charged with a number of offences after a man and woman were left injured in Melton Mowbray yesterday. The teenager from the town has been charged with wounding with intent to cause grievous bodily harm to a man, possession of a knife and using violence to secure entry into a premises. Leicestershire Police said the charges relate to an incident on Shepherds Croft and the man was due to before magistrates today. Police want to speak to this man after he was spotted carrying what is believed to be a firearm on Cunning Dale near Buxton - a designated site of special scientific interest (SSSI) where shooting is banned. The photos were taken on 20 March. Anyone with information has been asked to Derbyshire Police on 101. CCTV images have been released by police of three men who are wanted in connection with two burglaries at a business in Sandiacre, Derbyshire. The men are believed to have broken into the business in Bostocks Lane on Wednesday some time between 03:45 and 04:05 and taken a "large quantity of computer equipment." It was broken into again the next day between 00:50 and 01:44 with more electrical and computer equipment taken. Derbyshire Police said it believes both break-ins are connected. 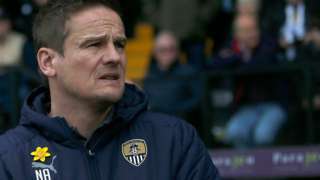 Notts County boss Neal Ardley says their status as the world's oldest football league club is weighing on their relegation fight. Campaigners lock their arms in a concrete barrel and block the entrance to a shale gas site. A teenager has been convicted of breaking a taxi driver's jaw as he tried to leave without paying the fare. Joe Connors, 19, of Dairy Way, Kibworth Harcourt was found guilty by a jury at Leicester Crown Court of grievous bodily harm. Leicestershire Police said that the driver picked up Connors and another man in Leicester on 11 August 2017 and dropped them outside The Railway Arms pub in Station Street, Kibworth where they said they would withdraw cash. The driver got out the car to stretch his legs while waiting for the men to return but saw them leave through another door, officers said. An argument then started between them and one of the men punched the driver in the ribs. The second man punched him to the face and threw him against metal railings causing him to hit his face. The driver suffered a broken jaw and cheekbone in the assault, needing reconstructive surgery and a metal plate in his face. Through their investigations, police identified Connors but have never found the other man. Connors will be sentenced on 26 April. 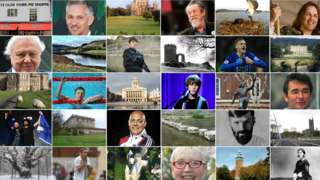 Will God help us through Brexit? Video caption: Will God help us through Brexit uncertainties?Will God help us through Brexit uncertainties? Police have revised the number of arrests made at an anti-fracking protest in Nottinghamshire from two to four. Officers were called to a test drilling site in Springs Road, near Misson, when protesters locked themselves together in a concrete barrel. Three women, aged 29, 41 and 69, and a 50-year-old man were detained on suspicion of obstructing the highway. The father of a murdered toddler is fighting to bring her home for her funeral. Eve Leatherland was poisoned and beaten to death by 31-year-old Thomas Curd, the partner of Eve's mother. He's been jailed for a minimum of 20 years, while 26-year-old Abigail Leatherland has been jailed for three and a half years for allowing or causing her daughter's death in Cornwall in October 2017. Eve's father Dean Bird, from Mansfield Woodhouse, wants to bring her back to the town for the funeral. But he isn't named on Eve's birth certificate so he has to go to court to try and bring her body back. That hasn't stopped him from planning her funeral though. He said: "I don't want anything black, I don't want anything sad. We threw a party last year for her birthday and I tried to make it as fun as I could. "I want white horses, white carriage, I want to make it a really big send off - she deserves it she's been sat there for 17 months frozen. She's gone through the worst thing anyone could imagine." The plans for Stanton Primary School would include three classrooms and a new kitchen - increasing the school's capacity by 70 pupils to a total of 210. Also included in the proposal is an extension to the school's hard-court play area, a new multi-use games area and additional parking. The application follows phase one of the school's expansion, approved in early 2018, which had included two classrooms and a new dining room. Derbyshire County Council is due to approve the proposals at its planning committee meeting on Monday 8 April. Planners say that expanding the school substantially is the "only viable option to meet the increased demand" from housing development in the area. This charming photo was taken in Belper this morning. Hope they got their mum something nice for Mother's Day! Police have asked for the public's help finding a 13-year-old boy who's gone missing from his home in Mansfield. Timo Hoyland was wearing a black and red Samworth top and white jogging bottoms when he disappeared at about 23:45 yesterday. Anyone with information on his whereabouts is asked to get in touch urgently. The RSPB is calling on people to report any sightings of hen harriers in the Peak District. The charity is relaunching its hotline to find out where the birds of prey are nesting in the national park. Hen harriers are on the verge of extinction in England because of illegal killing and there are currently only nine successful nests across the whole country - including one in the Peaks. The RSPB said if people let them know where the birds are spotted the nests can then be protected.